It is barely May, and yet it feels like summer. The flowers are popping everywhere in the yard, the weather is gorgeous and already so hot. The pool is almost at swimming temperature:-) Yeah… Thankfully my food craving are also getting me bikini ready! No more cravings of sweets, or comfy food. Instead I crave of food cooked on the grill, I crave of grilled tropical fruits. As I was browsing for recipes, I found this amazing recipe with Tiger Prawns that was so appetizing. Ingredients for 1 person: 2 cloves of garlic crushed, 1 tbsp of fresh ginger grated, 4 tbsp of sweet chili sauce, 1 tbsp of olive oil, juice of 1 lime, 2 tbsp of mint leaves, 6 to 8 large uncooked tiger prawns that you would have skinned (but left the tail on). Combine all ingredients and stir well. 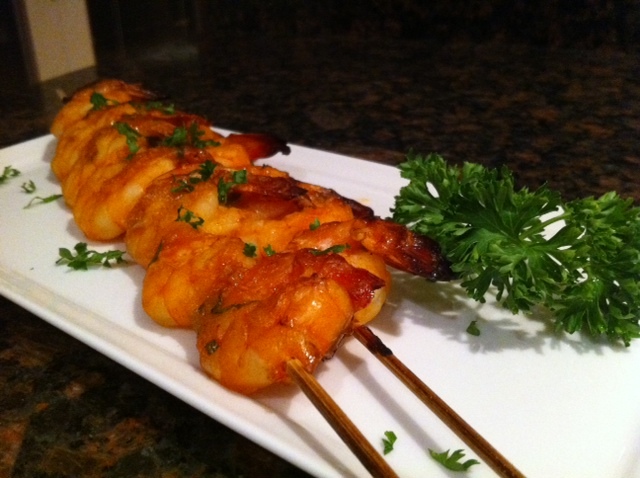 Thread the prawns on wooden skewers that you would have previously soaked in water. Brush the sauce over the prawns and cook on the grill 3 to 4 minutes on each side until tender or cook in the oven at 375 for 10 minutes. While the shrimps are cooking, prepare the salad. Skin the cucumber. Slice it in half, spoon out the seeds, and cut the cucumber in small slices. Skin the mango and dice it also. Mix in all in 2 cups of spinach. Drizzle the sauce over the salad and mix well. Spoon the salad on each plate and place a skewer on each plate as well.